Scientists at the Max Planck Institute for Astrophysics (MPA) have proposed a new model for recently observed extraordinarily bright supernovae. Fig. 1: Slice through the asymmetric composition resulting from a three-dimensional thermonuclear supernova simulation. Yellow/white indicates nickel while unburned material is shown in blue. Fig. 2: Simplified asymmetric composition of supernova ejecta (top) and the evolution of the observed brightness (as compared to the brightness of the Sun) resulting from the model (bottom). The red curve in the bottom panel shows the observation made from the direction indicated by the red arrow in the top panel. For reference, the black curve in the bottom panel shows the average over all directions. Supernovae have driven the development of astronomy and fascinated mankind for centuries as they are spectacular manifestations of the limited lifetime of stars. Indeed, the Type Ia subclass of these events, which is believed to originate from a thermonuclear explosion of a star at the end of its evolution, is among the brightest events that presently can be observed in the Universe. Such Type Ia supernovae are as bright as billions of Suns. But what makes them particularly valuable for astronomy is that not only are they bright but their brightness seems to be very uniform. Therefore they have been used as cosmic lighthouses to survey the Universe. This has led to campaigns observing Type Ia supernovae in large numbers. Recently, these observations showed that although the brightness of the majority of events is rather uniform, some rare events exist which are more than twice as bright as usual (e.g. Howell et al. 2006; Hicken et al. 2007). The explanation of these unusually bright Type Ia supernovae challenges the theory of these objects. In the astrophysical standard picture, a Type Ia supernova is due to a thermonuclear explosion of a white dwarf star (the end stage of evolution of light and intermediate mass stars) which accumulates matter from a normal companion star until it reaches a mass 1.4 times that of the Sun. This so-called Chandrasekhar mass marks the limit of its stability and the class of models that assumes an explosion once this mass is reached is termed "Chandrasekhar-mass models" of Type Ia supernovae. By fixing the amount of material to fuel the thermonuclear explosion, this scenario provides an elegant explanation of why Type Ia supernovae are so uniform. This appealing theoretical picture is now challenged by the new observations whose brightness may be taken as an indication that a more massive object underwent a "Super-Chandrasekhar-Mass explosion". In principle this may be possible if the white dwarf rotates rapidly or if the exploding object is formed by two merging white dwarfs. Such a variety of progenitors for Type Ia supernovae potentially jeopardizes the cosmological application of these events. But is it really inevitable? Recently, researchers at the MPA proposed a scenario providing an explanation of the unusual brightness within the conventional Chandrasekhar-mass model (Hillebrandt et al. 2007). The explosion is caused by a thermonuclear flame which ignites near the center of the white dwarf star and propagates outwards transmuting its material composed of carbon and oxygen to elements like nickel, iron, and silicon. In particular, large amounts of radioactive nickel are produced, the decay of which powers the supernova's brightness. 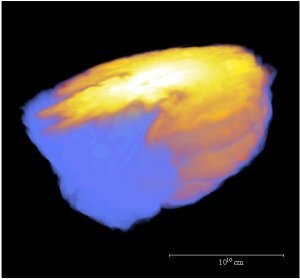 Conventional models ( Research Highlight October 2004) assume that the thermonuclear flame ignites evenly distributed around the center of the white dwarf. This leads to a symmetric spread of the flame over the star and an isotropic distribution of the radioactive nickel in the explosion ejecta. Such models cannot account for the brightness observed in the peculiar events. However, if the flame ignites off-center, its propagation is asymmetric and so is the resulting distribution of the radioactive nickel (e.g. Roepke et al. 2007). A large blob of this material may float to the surface of the star and give rise to a very anisotropic composition of the ejecta (the result of a three-dimensional simulation of such an event is shown in Fig. 1). Depending on the line of sight, such an explosion may substantially vary in brightness. Seen along the direction of the nickel blob it appears much brighter than seen from a perpendicular or reverse direction. Does such a configuration lead to brightnesses sufficient to explain the observations? This can be tested with a simple representation of possible ejecta compositions. An example is shown in the upper panel of Fig. 2. Here, the ejecta contains a blob of radioactively unstable nickel (yellow) which is shifted upwards from the center and is embedded in a shell of stable material (blue). What would an astronomer observe from such an event? Typically, supernovae brighten over a few days, reach peak brightness and then fade during the following months. For the asymmetric model, the brightness of the supernova was calculated as it would be observed from different directions (lower panel of Fig. 2). As can be seen in the animation, both the maximum and the evolution of the brightness depend on the angle at which the supernova is seen (Sim et al. 2007). It is brightest in the direction of the nickel blob and, in fact, as bright as the recently observed extreme events. In this way, even these brightest supernovae might be explained within the Chandrasekhar-Mass model.